Jewish education also is an important part of the Hillel agenda, said Ms. Pototskaya. Hillel provides an alternative to Orthodox STARS courses, presenting a more pluralistic interpretation of Judaism than that offered by Chabad. Further, she noted, non-halachic Jews are welcome in Hillel. Jewish education is transmitted both formally and informally, the latter including Shabbat dinners and other holiday observances. Student artwork also may focus on Jewish traditions. Kharkiv Hillel sends two busloads of young adults to Israel on Taglit tours every year, stated Ms. Pototskaya, and conducts follow-up activity with Taglit participants upon their return. Hillel post-Taglit programs include overnight seminars that also attract young people from Jewish Agency and local Israel Culture Center Taglit trips, she noted. Although the Israel and Jewish-identity building missions of Taglit are the most important aspects of Taglit, Ms. Pototskaya said, she also views the Taglit program as an "instrument" in bringing new students into Hillel. In response to a question, Ms. Pototskaya said that the only international visitors to Kharkiv Hillel during the 2011-2012 academic year was a student delegation from Yeshiva University in New York. She remembers with nostalgia past visits from Hillel groups from the University of Michigan and from a group of universities in the Washington/Baltimore area. She is disappointed, she said, that American Jewish students no longer seem interested in such tours. It is very important for Ukrainian Jewish students, who are somewhat isolated from other Jews, to build contacts with young Jews in other countries; mutual observance of common rituals, she continued, helps to strengthen a sense of Jewish community. When asked by the writer if she had anything to add to the interview, Ms. Pototskaya responded that it is "important" for others to know that Kharkiv Hillel is still "growing" (растëт). 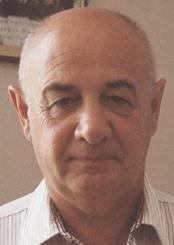 Boris Murashkovsky is one of the most experienced hesed directors in all of the post-Soviet states. The hesed no longer operates any hot meal programs or distributes food parcels. Instead, he elaborated, the hesed continues to develop its smart card program, which permits clients to purchase what they want at discounted prices at a specific chain of supermarkets. Smart cards also can be used at specific pharmacies. The smart card system delivers data to the hesed that records when and where the client shops and what he or she purchases. The hesed patronage service (home health care) also is fully computerized, a reality made possible by advanced technology installed in the new hesed premises. The new data that is now available enables the hesed to target its care and provide more and better service to those who need it. Holocaust survivors continue to receive more comprehensive assistance than others of the same age and disability who were not in an area under Nazi occupation during World War II, Mr. Murashkovsky replied to a question. The gap between the two groups has only increased during the last year because the Conference on Jewish Material Claims against Germany (Claims Conference) increased its assistance to survivors and a special allocation that was supposed to address the service gap for non-survivors did not materialize in 2012 as had been expected. The new building enables the hesed to expand its programs for children, Mr. Murashkovsky said. A critical new program works with autistic children and their parents. An Israeli specialist in the field led a three-day seminar for hesed staff and helped them develop individual work plans for addressing the specific needs of each of seven autistic youngsters; as many as 25 more affected children are on a waiting list for such plans when the hesed develops capacity to work with them, Mr. Murashkovsky stated . World Jewish Relief of Britain has funded a "relaxation room" with equipment geared to their needs, but additional financial support and staff training is needed to work more effectively with this population group, declared Mr. Murashkovsky. The new JDC building, which the hesed shares with a JCC and with JDC offices provides a good atmosphere for hesed work, Mr. Murashkovsky stated in response to a question. On a purely practical level, the building is closer to public transportation lines and, therefore, is more accessible to its clients. Greater available space permits the operation of two senior adult day care shifts every day, each accommodating 20 people. Further, said Mr. Murashkovsky, a large, modern elevator and handicapped-accessible rest rooms enable older people to use both levels of the building with ease. He believes that the general atmosphere in the building is welcoming and makes people feel comfortable. 32. 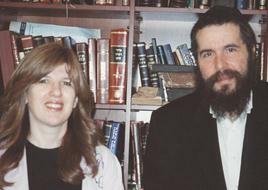 Rabbi Moshe Moskovitz and his wife Miriam Moskovitz have served the Jewish population of Kharkiv for more than 20 years. A native of Caracas, Rabbi Moskovitz is among the veteran Chabad rabbis in the post-Soviet states and is highly respected in the city and beyond. Mrs. Moskovitz, a native of Australia, also is very active in the community and is highly regarded. Rabbi Moshe Moskovitz and Mrs. Miriam Moskovitz are highly respected in Kharkiv and in Ukraine generally. 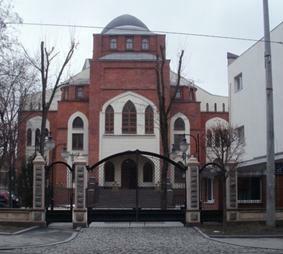 Among the many achievements of the Chabad couple is recovery of the centrally-located and large choral synagogue and its restoration in its initial design. Originally constructed in 1903, it was used as a sports training facility during most of the Soviet period. In addition to a large prayer hall, it now also contains: a basement with a large kitchen and dining hall, medical dispensary, and three classrooms; a ground floor with the large prayer hall, a sizeable lobby, and offices; and two upper floors with a total of eight classrooms, several club rooms, and a library. Photo: http://www.geocaching.com/seek/cache_details.aspx?guid=cfe30ad3-cb0c-48cf-9f9f-ba8f426b484c. Retrieved October 3, 2012. A Chabad Community Board of Trustees consisting of about 50 individuals (including the Jewish mayor of the city), is very active in supporting Chabad operations, said Rabbi Moskovitz. Officially, he continued, membership on the Board requires a monthly donation of at least $1,000, but some people give much more and some give less. No pressure is applied to those who contribute less, he noted. Serious inflation and unanticipated program costs resulted in a deficit during the previous year, Rabbi Moskovitz stated. An emergency Board meeting was called, attracting most Board members (including the mayor), many of whom made additional pledges to address the deficit. Unfortunately, local economic conditions are such that the deficit continues, but the Board is diligent and generous in attempting to raise sufficient funds, averred Rabbi Moskovitz. They feel a strong responsibility toward the local Jewish population. 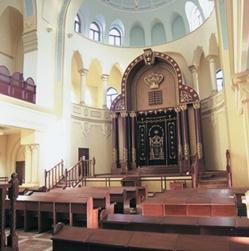 The interior of the synagogue was restored to its former elegance under the direction of Rabbi and Mrs. Moskovitz. Used as a basketball court and then abandoned under the Soviet regime, the magnificence of the sanctuary is a point of pride to many local Jews and a tourist attraction for others. See the writer's Jewish Community Life in Post-Kuchma Ukraine: Report of a Visit March 20 - April 8, 2005, page 49, for a brief account of a visit to Kharkiv by a delegation of Hillel students from the Washington/Baltimore area. The Kharkiv and American groups did volunteer work together, called on Jewish elderly in their apartments, celebrated Purim together, and engaged in other joint projects. See page 54 for information on dining services provided by Chabad. See pages 57-59 for information about the new JDC building in Kharkiv. Kharkiv is one of a number of communities in which tension has erupted between survivors and non-survivors over the greater benefits available to the former. See pages 66-68 for information about a program under Jewish auspices that works with autistic children in Kyiv. See pages 58-59 for a report of an interview with Oksana Galkovich, Director of JDC operations in Kharkiv.